Picture a muddy river, swollen with rain and rushing over rocks. You fall into that dirty water and cannot fight the current for long. Your head goes under once, then twice, and both times you come up sputtering after swallowing some of the filth. A third dunking might kill you. 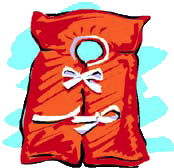 Suddenly, from the shore, someone throws a life preserver, which floats past your chest. Will you grab it? The answer seems obvious, of course you would; but too often people drowning in the world’s fast moving current refuse to grab onto the spiritual life preserver, Jesus Christ. He died on the cross for all of humanity, but individuals have a responsibility in salvation. A person must recognize his or her own helplessness and acknowledge the need for Christ. That means the new Christian accepts Jesus sacrifice as true and personal, believing that there is no other way to be rescued. It isn’t necessary to understand everything about faith and the Bible in order to be saved. God will ensure that His children learn whatever they need from the Holy Spirit. However, it is critical to realize that we cannot save ourselves. Can you point to a time in your life when you received Jesus Christ as your savior? God is calling and longing for you to recognize your need for Him and to pray for rescue from sin. He is faithful to answer by saving you and making you blameless before Him. God is offering you a life preserve and waiting to pull you to eternal safety. The choice is your. Will you choose Christ and live?